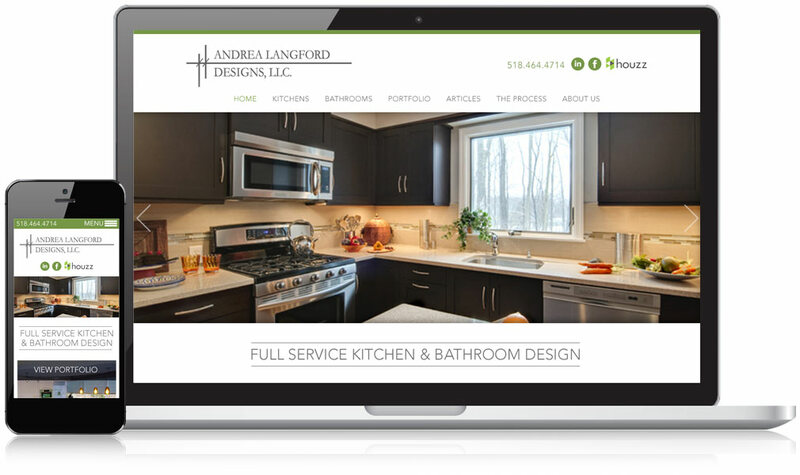 Andrea Langford provides one-of-a-kind interior design services for homeowners across the Capital District, from Albany to Clifton Park to Saratoga Springs and beyond. Her kitchen and bathroom remodeling services, industry knowledge, and personal approach are second to none- something her website desperately needed to convey to new customers who were searching for professional interior designers. Working in a highly visual field, Andrea’s new website brings forth her stunning project photos to capture visitors’ attention from the start. To help potential clients find the most relevant information for their interior design needs, custom designed calls-to-action and a user-friendly main navigation menu guide visitors from the home page to the portfolio that best matches their interests. As visitors land on the unique portfolio pages, continued emphasis is placed on the images of Andrea’s work so they can get a visual feel for the quality of her services. Of course, homeowners have many questions before committing to an interior designer. While Andrea has the answers, conveying all of that great information on a typical Frequently Asked Questions page (which can often be quite lengthy) would be challenging, especially for tablet and smartphone visitors. To simplify the user-experience while making the FAQs easy-to-use across devices, we implemented an accordion-style drop-down menu for each FAQ on the page. As visitors move through the new website learning more about Andrea’s remodeling services, strategically placed calls-to-action are prominently displayed to reinforce the primary goal of the website: getting potential clients from Albany, Saratoga Springs, and beyond to contact Andrea about their next project. We work with interior designers in any state or country, and can affordably redesign your site the right way for more leads. Let’s talk.